I love oats. Really. I love them. Oatmeal cookies, oatmeal, oats in every kind of baked goods… So, when I stumbled across this easy oat recipe, I was thrilled! It takes very little time and effort to put together. I love using jars for this because then I don’t even have to stir, I can just shake. I can put together oats for me and oats for M in just a couple minutes start to finish and then we both have a delicious, filling, and healthy breakfast! 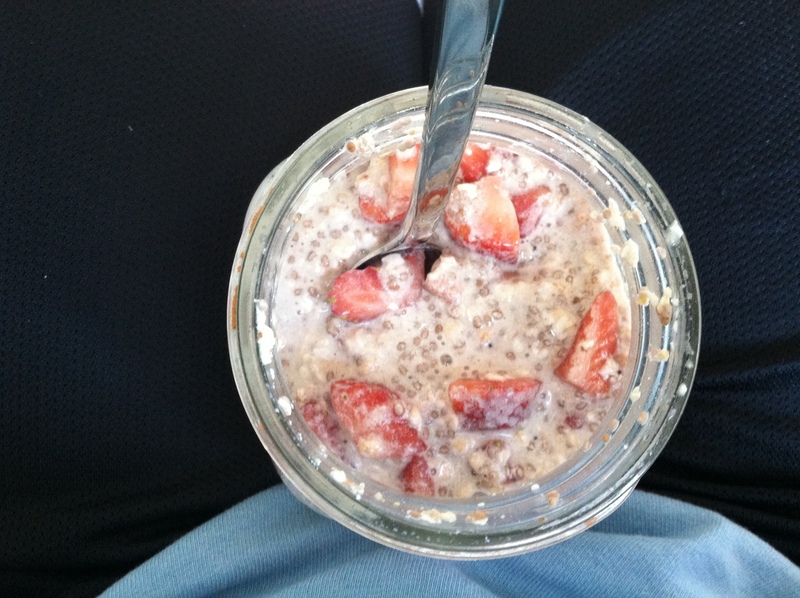 In these Overnight Oats, I used Strawberries instead of Bananas—I like it better with Banana. Mix everything together in a jar. You can also put it all in and then just shake it to mix it up (my favorite way)! Let it sit overnight. I’d recommend taking it out a little before you eat it if you don’t want it to be too cold. It’s good on the slightly warmer side and it’s good straight out of the fridge. I’ve done it both ways! I adapted this recipe from Skinny Taste’s Overnight Oats.